We've heard of mindfulness before ... but what if "brofulness" is the path to health and inner peace? We’ve heard of mindfulness before … but what if brofulness is the path to health and inner peace? San Francisco-based photographer Hannah Rothstein, who previously saw her “Dr. Dreidel” became an online sensation during Hanukkah, has come out with “Broga,” a new form of yoga that blends Bhakti with beers. "With a lifestyle of pounding beers, impressing chicks, and getting yolked, there's no one that needs to bliss out more than bros," she writes on her website. "To make enlightenment accessible to the brotastic brethren, this new workout craze adapts yoga to the bro culture." Rothstein's photos play into the hard-partying bro stereotype, which of course not every fraternity brother adheres to — but there is definitely some fun to be had with the idea. After all, don’t expect to find a simple “downward dog” here: “Broga” poses combine the stretches you’ll see in a studio with the immense physical exertion required for a night of partying. Take “Linebacker II,” for example. 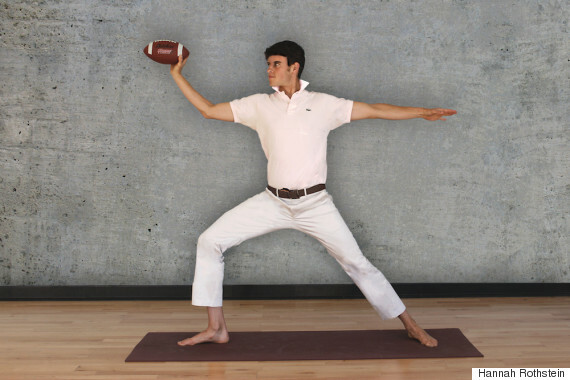 The pose involves facing a wall, bending your front knee, raising your arms and holding a football with your forward hand. You then have to toss the football to a freshman. Then there's "Chest Bump Moon." This is a modification of a common bro greeting. It involves facing a partner, raising your arms, bending your back and touching chests, as one might do following a touchdown or a keg stand. This is a great exercise for your biceps and triceps. You grab a keg's handles, kick up your legs against a wall, and then CHUG! CHUG! CHUG! It's a good one to do with a partner the first time around. 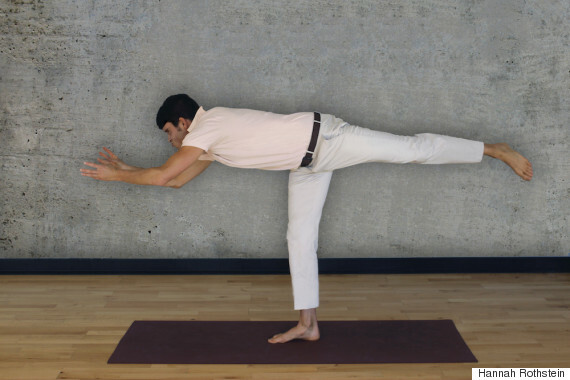 As it happens, Broga is a thing that exists. Pix11 reported last week that yoga for bros, focusing more on the physical than the spiritual side of the practice, is becoming increasingly popular throughout the United States. It was introduced by yoga instructor Robert Sidoti in 2009, and it helps guys build strength without any chanting. "I think with Broga guys come in feeling a lot more at ease," trainer Justin Flexen told the network. "We play rock music and it's a lot of fun." Insensitive Boar-ior III: Balance is necessary for this pose. Stand on one leg, reach your arms forward and your other leg back, so your body appears horizontal. Rothstein instructs posers to extend those arms as though an attractive woman is walking by. Manchild's Pose: Think of all those times that life has ground you down. Then kneel, close your fists tightly and lay your torso on the floor. Act like your favourite hockey team just lost a playoff series. 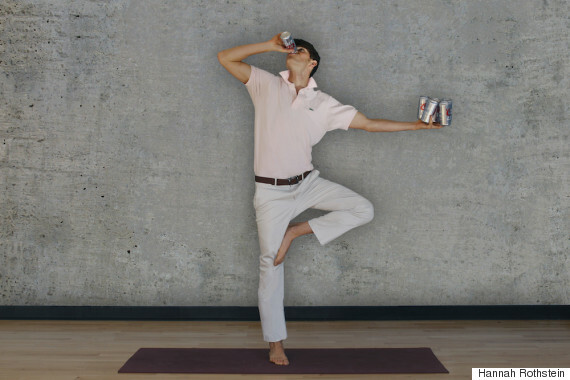 Shotgunasana: Props (beers) are necessary for this pose. Take a six-pack (cheap brews are preferable). Remove one. Open it. Raise it to your mouth. Extend your other arm and balance the rest of the beers on your remaining hand. Take one foot and rest it on your other thigh. DOWN IT! Shitfaceasana or "Corpse Pose": This one's great for a cool down. Just lie down and spread your arms and legs. It's a rewarding rest after a long stretch of partying. Check out the rest of the poses right here.